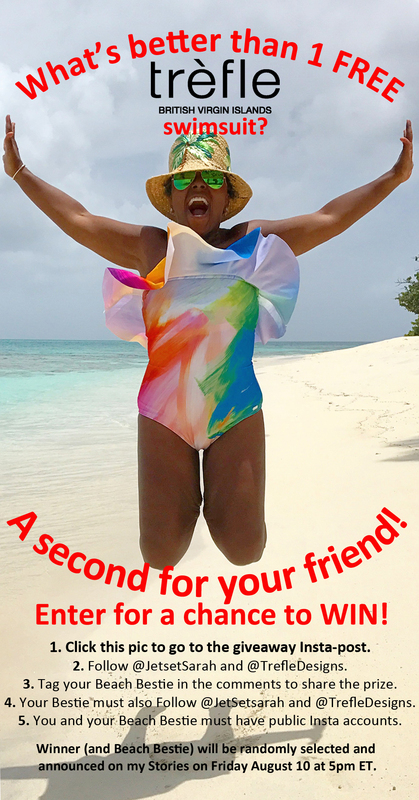 Win TWO Free Swimsuits NOW! What's better than winning a free swimsuit? Winning two of them! And that's what you just might do when you enter my Instagram giveaway. I've partnered with British Virgin Islands-based Trefle Designs – whose suits have been worn by Beyoncé, Chrisette Michele, (and me in the photo!) – to offer you two maillots from their 10th-anniversary Zion Collection. So you and your beach bestie can be stylin' on the sand this summer in either the reversible Ashley or the strappy-back Angel. And it's SO easy to enter. Just click on the photo above or on this Instagram post and follow the instructions. The giveaway closes on Friday, August 20th at 5pm ET, so enter NOW!